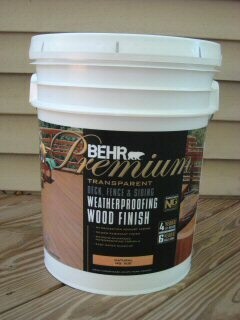 Two Summers ago, we wrote a review of Behr Premium Weatherproofing Sealer. The general sentiment of our initial review was positive. The color wasn’t exactly what we had hoped for (it was too orange), but if the sealer held up over time, we’d be OK with the results. When we were considering different deck sealers, Behr’s product was advertised as guaranteed for four years on decks, six years on fences. If you look closely on the picture on the right, you’ll see the 4/6 on the lower right of the container. Our primary reason for purchasing this sealer was its expected long life, as our deck is large and sealing it is a multi-day project. Over the past 22 months, we’ve been monitoring the sealer’s performance and periodically taking pictures of it. Unfortunately, we’re unhappy with the results, as are many others (read the comments on the initial review–there are many). Before we show you these pictures, I’d like to say that we’re generally very happy with Home Depot. In fact, we publish Home Depot’s Coupons on our site and we do about 1/2 of all our home improvement shopping there. Just like many of you, we don’t spend a lot of time singing the praises of our good experiences, which outnumber the bad ones 10 to 1. As you can see, the color is pretty uniform and dramatic. While we weren’t a fan of the orange tone, it grew on us overtime (and actually turned out to darken a bit within a few months). Here’s a picture of the sealer at 7 months. To be fair, this shot is taken in the late Fall with different lighting and just after rainfall. You’ll notice that the color has faded quite a bit. Perhaps more concerning is that the sealer is no longer universally beading water. Finally, here’s the sealer just 22 months later. You’ll notice that the color is no longer uniform and water beading is a thing of the past. 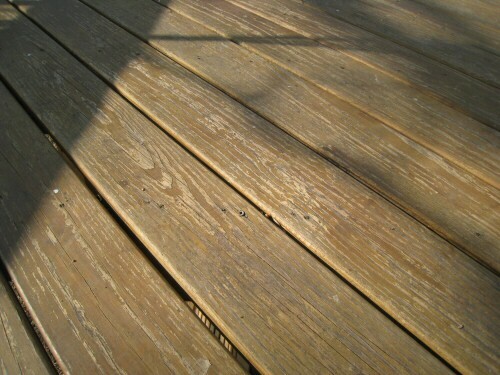 We’ll definitely need to refinish this deck with a new sealer. How Long Does Deck Sealer Last? After doing an extensive amount of research online, the general consensus is that every deck sealer lasts about a year, even when they claim a longer wear time. With that prognosis, composite materials are looking pretty attractive. What do you think? Do you have a good or bad experience with Behr or another deck sealing product? Let us know about it in the comments. Oh man that’s such a bummer it can’t last longer! you guys have such a huge deck! Your experience with sealers is common. What makes them last more than one year is all about the preparation before applying the stain/sealer, cleaning of the deck regularly after it’s been sealed, and the weather. The biggest mistake most people make is just re-applying the material right over the old material. The deck surface must be cleaned and rinsed well, and stripped if the old material is still beading up at all. Normally a solution of bleach and water is sufficient to clean a deck for re-sealing, or a commercial cleaner/stripper works fine. The deck must be scrubbed by hand with a deck scrubber on a pole – avoid using pressure washers! Well we’ll definitely follow up once we re-seal it this summer. We’ve used Thompson’s clear-coat on the privacy fence at our rental property, and that seems to be holding up a little better. But we’ll do a one-to-one after I re-wash (sigh) and we re-seal the deck this season. @ Mikey – our deck’s way too large to scrub by hand, but I have read that we can spray it down with stripper (we’re going to try your bleach/water recommendation – thanks!) and then pressure wash it after that soaks in. It had never been stained or sealed before this time, so it wasn’t for lack of a ready surface that it didn’t “take.” It beaded for a couple of months, then just stopped. Very disappointing. We used Sikkens Cetol Dek on ours, it’s lasted over 2 years, but starting to look thin where there’s lots of traffic. We’re going to have to redo it this year too. Now that the snow is gone i’m really amazed, the deck still looks like new! I plan on writing about it soon to show what it looks like. The true test will be after another long summer in the sun. Todd… Do you have any final reviews on the One-Time wood protector? I am about to stain our hand made carriage house garage doors and want to choose the best product. I had decided to go with Behr initially but after reading reviews I’m second guessing that. Our doors are made from cypress and I really don’t want to get into the stirpping and re-staining every year. I can tell you that after having this on our deck for a couple years it has out performed any other wood sealer/stain that I’ve ever used. I’ve used countless products and none of them compare to this stuff. I’d check their site to see what they recommend for cypress. Just got done staining my deck with One Time deck sealer today. I am resealing directly over the One Time I put on about 5 years ago. My deck gets hammered with sun, so it’s gotten beaten up pretty good. I’m in NW Ohio so it gets hammered during winter as well. I put on the red cedar both times, which is pretty dark. First, I never washed the deck, not once. It lasted well for 5 years, but the last year it started losing the color. I think it was still protecting it, but the color wasn’t as vibrant and it looked gray from dirt in high traffic areas. This spring I cleaned with a pressure washer and frankly it looked pretty good. The gray went away with the wash, but it was much lighter so I decided to reseal. You can just stain the deck right over the old One Time-easy. Sealing the deck takes 3/4 day to powerwash and a 1+ days to stain. I am sold on One Time because I don’t want to do this every year or every other year. It’s very expensive but I figure it lasts for years where the other stuff doesn’t. I got it Andersons and Ace Hardware and will be back in 4-5 years to refinish again. Thanks for the input, Bob! That’s very timely for us (since we hadn’t settled on a product for this year’s redo, yet)! One of the biggest mistakes people make when they are dealing with finishing any wood is the easiest method of application is chosen. To have a long term finish preparation and product application is key. – Never use a strong spray (NO POWER WASHERS) It will look good but pit the surface which will cause faster blotchy deterioration over time. The surface will become weaker and less able to hold the finishing product(s). – Always be careful when it comes to moisture. Ensure the deck is PROPERLY dry before you move on to the next phase of the project. It might be helpful to obtain a moisture meter for true testing of the wood. What looks dry…..
– Unfortunately I have never had luck with any product that is to dry hard ON a flat surface such as a deck. (Paint like products) I prefer products that are absorbed into the wood’s pores such as oils or tinted oils. – Work slowly, don’t rush to finish quickly. My finishes usually will last 3 years looking fantastic and the next 2 years it slowly shows the deterioration. I get the 6 – 7 years and no pealing!!! Decks are a whole different animal than fences etc. and stain is the same. Their are so many varaibles that will effect the quality of the finished job and the durability. Cleaning and proper prep is the # 1 reason for any product failure form the cheapest low tech to the most expensive high tech. The second reason for failure is inproper application and less than optimal conditions. Staining a deck takes a lot of work and time to be done properly.More is not better it is more and not what stain is all about.It should not be applied like paint and the durability is majorly affected by the age, type,chemicals in the wood and prior use of bleach which will be the end of any staining project and kill the life of your deck.The stain will not make a neglected 3 to 5 year old deck new it will whitewash the surface for a year or so and fall off because the surface is no longer wood it is a mixture of everything that has been allowed to stay on that deck and spilled on that wood for 3 to 5 years.Painting or staining on sand or cardboard with the best possible product would be about the same.and expecting it to stand up for 5 years. Not going to happen no matter what you use.All tests are done on the best prepped surfaces possible to optimize results and hergo the claims and paper gurantees. Good Luck Better Chance with lots and lots of prep NO BLEACH!!! The plastiron 7 year warranty stain they say has very high metals content is this better than very high acrylic or oil? The guy said that high metals is like mirrors reflecting the sun and metal lasts longer than plastic in the weather. do you know bob? The good folks at Certified Contractors Coalition sent me some different companies to give us bids on getting our fence and deck cleaned and stained. Ultimately we went with the guys that use Plastiron stain. I have to say that it looks like normal stain until you get 3 feet away from it and then you see all kinds of little sparkles. They said its the metal particles. I hope it lasts as long as they say it will. Thanks to all of you for your comments. It was helpfull and reasuring. I also have a large deck and I have been stripping it for the last 2days and still have a bit more to go. Thankfully the old fininsh is comming off pretty well. We have had to redo our deck about every two years, and have tried different brands it doesnt seem to matter. Good luck to all of us. I used one time last year and now it looks dusty and low in color.It only looks good wet.I would like to restoree the deeper color with either acrylic or oil base clearcoat.Which one? I never thought so many people would use Behr ANYTHING! Example for paint.. why use Behr when there is Sherwin Willams? If you have ever painted with Behr and then painted with Sherwin Williams you would know why to never touch Behr paint! As for staining or even waterproofing by all means.. try Defy! No, I’m not at PR person for them, I was told by a contractor that there is nothing on the market like it. I purposely chose to do all of the flooring in a composite simply because of the traffic and then fact that I knew that water beading wouldn’t be an issue. So my flooring of the deck is all composite while the railing and posts are simply pressure treated. I applied Defy semi so that I could get the seal/stain but have the grain show through (and unlike most I am a fan of knots in the wood). It has been 7 years, and the stain/seal is still like day one. Granted, this is not flooring so there is no traffic to wear at the finish, but the horizontal hand rails are both 4 inches where there are steps and the body of the deck has railing that is 6 inches wide (I built planters for flowers into the body portion of the deck of the railing). 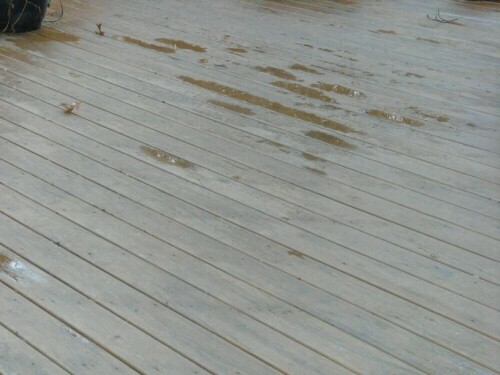 And those horizontal areas are still perfect and the water still beads evenly over the deck. I live in MD, so I get both sunny warm/hot summers to snowy winters where the snow sits around for days/weeks. Now Defy is definitely not the cheapest, it is rather pricey, BUT when you consider the time it takes to prep/apply for one time in 7 years.. I think you get the idea. Thanks for all the tips, Bryant! i am enjoying all the above statements about different deck sealers, my question is where do you buy the product DRFY as i am very impressed with the statement by bryant. I’ve tried Behr, TWS, Floods CWF, and a few that I’ve forgotten about and nothing lasts for than a year. My deck is 16×33 so replacing it with a composite is a bit pricey. If stripped my deck each time I’ve tried a new product. Deck gets full sun in the afternoon so I don’t think there is a product made that would last more than a year. Not to mention the Nebraska winters. 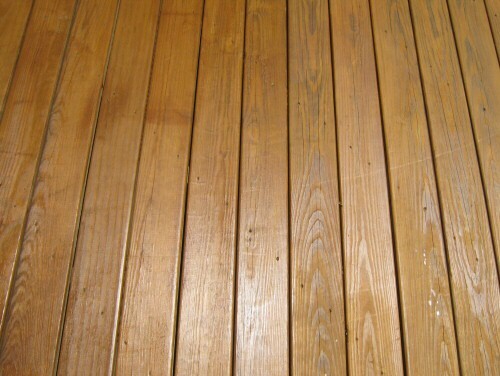 I’m thinking the only thing I can do other than restaining every year is use a product such as Deck Restore. than you so much for this review/updated review with helpful photographs. it has helped me to make up my mind about using the Behr sealer!